For all those who don’t get our Christmas card through the mail, here’s a color copy of it. 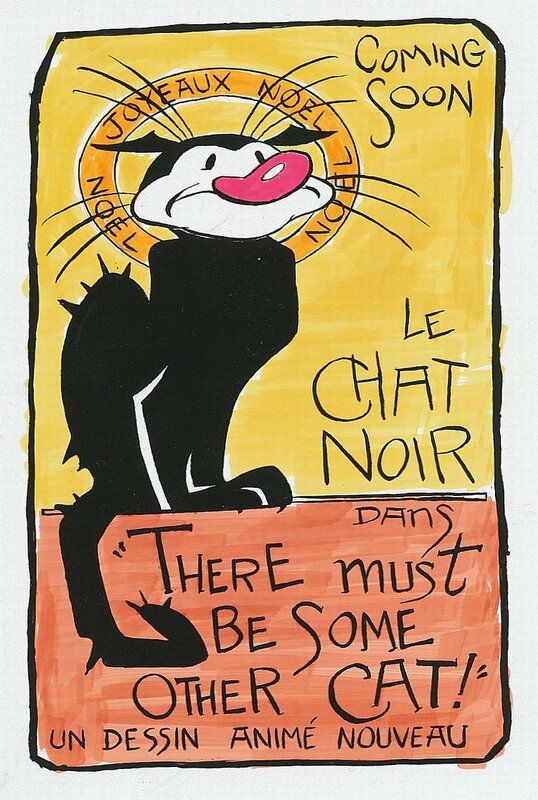 It’s patterned after the famous “Le Chat Noir” French poster by the artist Theophile Steinlen. 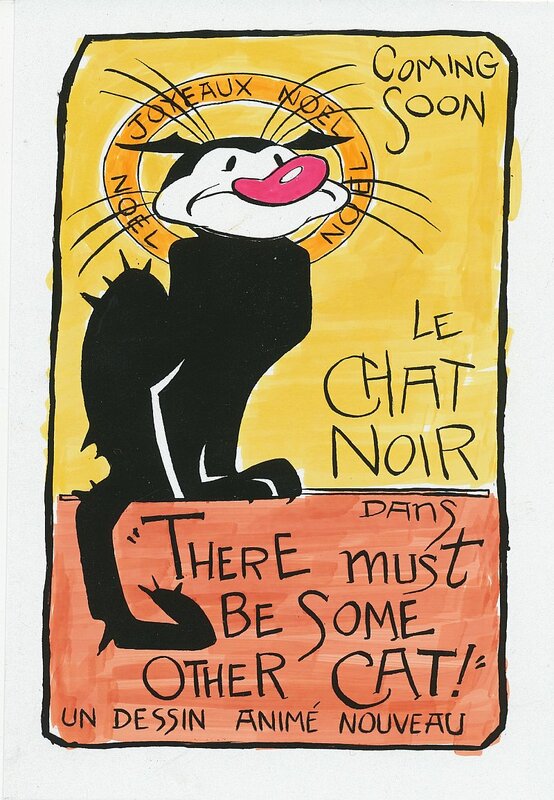 The poster was designed to advertise the Paris night club “Le Chat Noir” in 1896, one year before the club closed it’s doors. The pioneer animator Emil Cohl was a frequent customer, as were the cartoonist Caran D’Ache and one of my favorite composers Erik Satie. The card is a subtle way of reminding people that the next “Cat” cartoon short should be making appearances next year in festivals. It’s very close to production photography, but still a few weeks or months away. I sketched this giant Teddy Bear outside the Tea Room at the Langham Hotel in Pasadena on the 5th, as Cathy did an Artist-In-Residence demonstration. 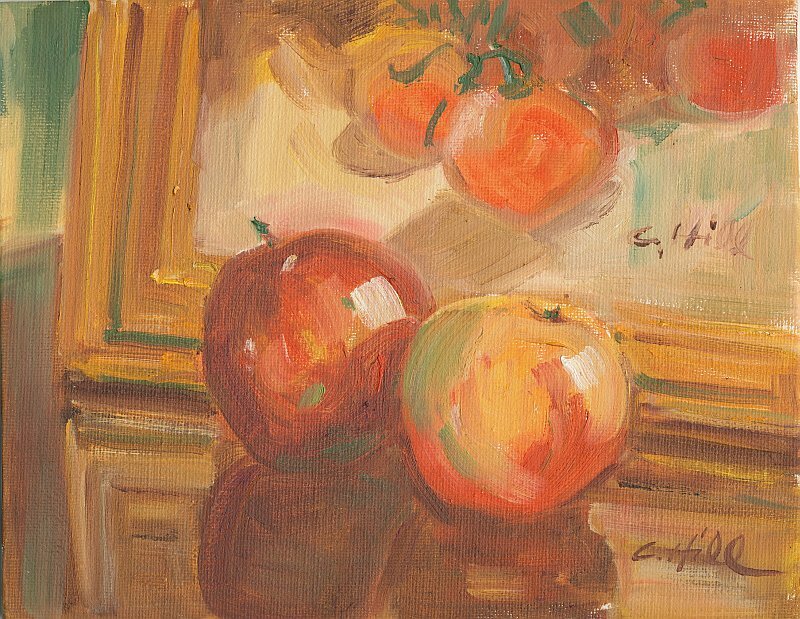 She painted a still life of apples sitting in front of another painting she made of tomatoes: I’m not invited to paint when Cathy is at the Langham, so I fill the time by sketching. I tried to get the values in the room, it was dimly lit, with the main source of light coming from the fixture on the wall. 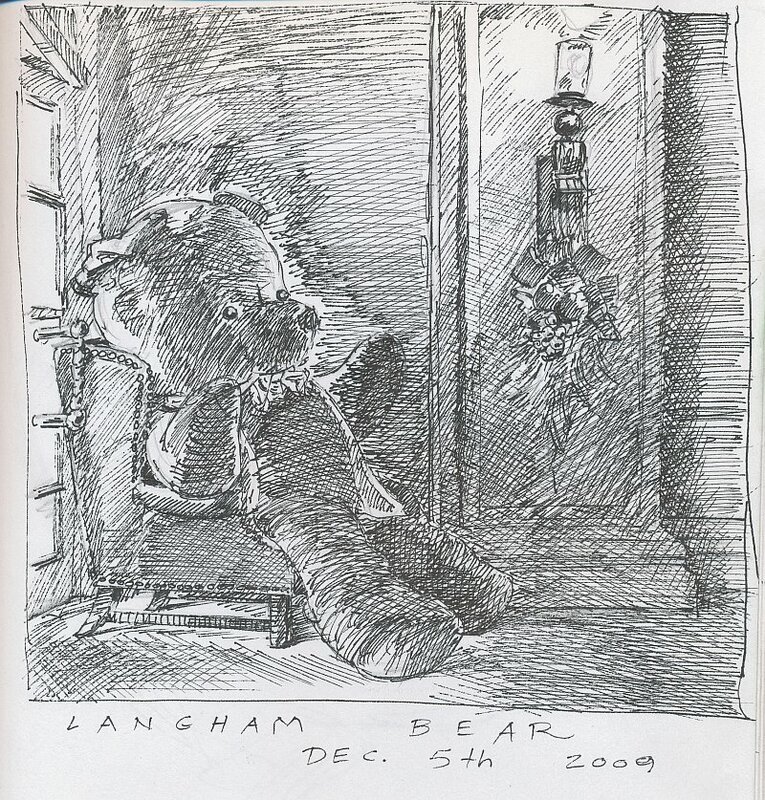 The stuffed Bear was really large and his fur was quite dark as well, so lots of cross-hatching was called for. Felix this time is from 7/27 to 8/2/1936. Snobbs has a perpetual job of sitting Mrs. Boo’s baby. Felix gets a lot of laughs from Snobbs’s troubles in the 7/30 and 7/31. In the 8/2 Sunday page, Snobbs is forced to put Felix out by Mr. Dooit, and it’s clear that Felix and Snobbs are getting to be friends. 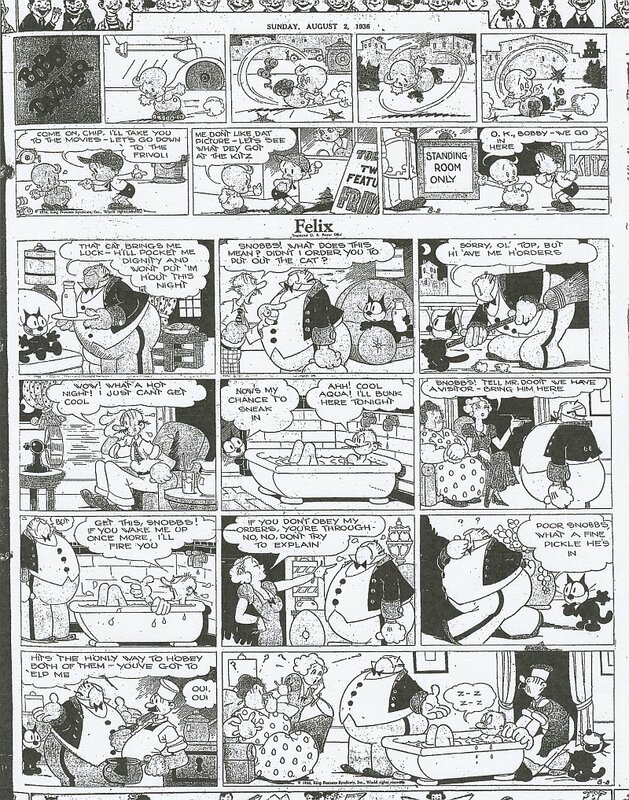 Felix sympathizes with Snobbs when he has a conflict between Mr. and Mrs. Dooit in the final panels of the page. 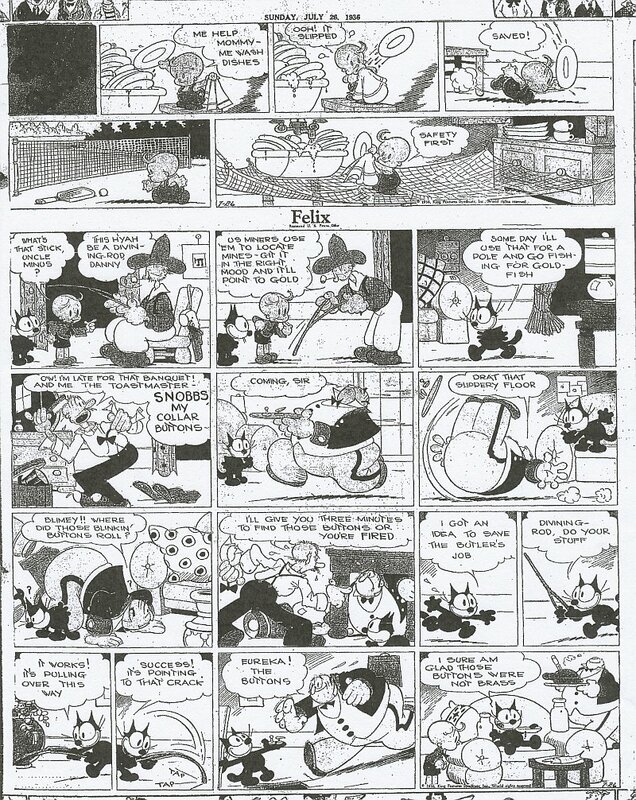 Krazy from 1/15 to 1/20/1940 is a miscellany of Ignatz frustration gags. Krazy’s dialect in the 1/16 is especially delectable, “Toot-Pigg”, “Pentsil Witla” and “Piggits”. I enjoy reading aloud and Christmas time doesn’t seem festive without a story. So I dusted off my volume of “Christmas Tales For Reading Aloud” and found a story that fits the Cat Blog, “The Mouse Who Didn’t Believe in Santa Claus” by Eugene Field. Field was born in St. Louis, in fact his house has been preserved in downtown St. Louis. At Christmas time, the house is decorated and they have warm cider for the tourists who visit there. Field’s most famous poem for children is “The Duel” or “The Gingham Dog and the Calico Cat”. He also wrote “Little Boy Blue” and “Wynken, Blynken and Nod”. This story: “The Mouse Who Didn’t Believe in Santa Claus” is a lot less famous. It is condensed from the story “The Mouse and the Moonbeam” (1912). It is really a pretty grim little tale, not really appropriate for the very small child, or those easily frightened. The moral might as well be, “You’d better not pout, you’d better not cry, or you die.” I recorded the story on the computer microphone, and you may have to boost your volume a little to hear it properly. It runs about 9.5 minutes, and I really enjoyed reading it to you. I hope to record more stories some time, if I get any reaction from this one, including tips on improving the recordings technically. Listen at: http://www.zshare.net/audio/7012671401b8f2a1/ . This is on a file-sharing site called ZShare. It is ad supported, so you may get some pop-ups if you go over there, also some of the ads displayed on the page are a little bit “R” rated, so use caution if that offends you. If any of you know how to embed a player in this here Blog, let me know. Ya know, come to think of it, The Gingham Dog and the Calico Cat both are destroyed by the end of that poem, so Field never flinched from the grim and gruesome. Kids really love the stuff, anyway. The best and the warmest wishes of the season to all you loyal readers out there in the “Internets”. This blog couldn’t exist without you; Happy New Year, too! Howdy Readers! 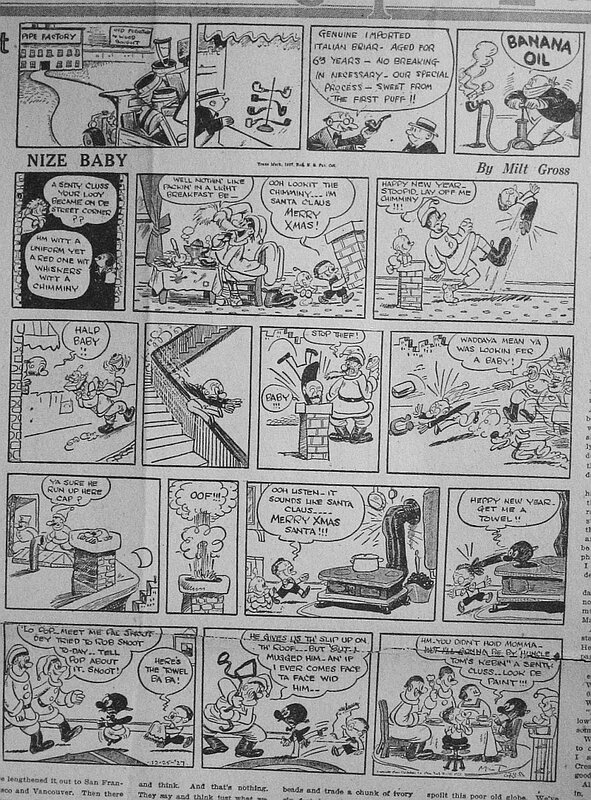 One of the loyal ones, Al, requested more “Nize Baby” strips. Alas, I only have one left, but it’s appropriate for this time of year, originally ran 12-25-1927. Papa is in trouble after trying to rescue his baby from an artificial chimney. After Papa goes through a sooty stove pipe, he is an “Huncle Tom’s Kebin” Santa, so he won’t be recognized and beaten up by Looey’s pal and ersatz Santa, Shoot. Shoot thinks that Papa was trying to rob his “Selvation Harmy” chimney! Henjoy this one, from the Los Angeles Examiner and the manic pen of Milt Gross. Felix this week is from 7-20 to 7-26-1936. The Dooit’s butler, Snobbs, is still trying to mind Mrs. Boo’s baby. I like the 7/24 See-Saw gag, as Felix laughs uproariously at Snobb’s attempt to balance his weight against the baby’s. The Sunday page from 7/26 is beautifully drawn, Uncle Minus’s devining rod finds gold collar buttons, saving Felix’s home life once again. Bobby Dazzler’s kid brother in the top strip, looks like “Vontzy” from the Charles Mintz Scrappy cartoons! Krazy this week is from 1-8 to 1-13-1940. Krazy discusses his musical ancestry in the 1/9, branching out to Kat Whiskas in the 1-10. If you’ve ever owned a crystal radio set, you’ll know what kind of “Cat Whisker” Krazy is referring to. It’s a very thin wire that moves over the tightly coiled wire that is the heart of the radio, and tunes in the stations by touching different parts of the coil. By the way, what happened to Offissa Pupp’s buttons and star in the last panel of 1/9? Were his ancestors so “hot” that the tin ornaments melted off his chest? I’ll end the post this time with another column from 8-1-1928 illustrated by Webb Smith. I’ll try to post again before the sleigh touches down! You are currently browsing the Mark Kausler's CatBlog blog archives for December, 2009.